Saint Ignatius, on his way to Rome to be martyred, visited Polycarp at Smyrna, and later at Troas wrote him a personal letter. The Asia Minor Churches recognized Polycarp's leadership by choosing him as a representative to discuss with Pope Anicetus the date of the Easter celebration in Rome-a major controversy in the early Church. At 86, Polycarp was led into the crowded Smyrna stadium to be burned alive. The flames did not harm him and he was finally killed by a dagger. The centurion ordered the saint's body burned. 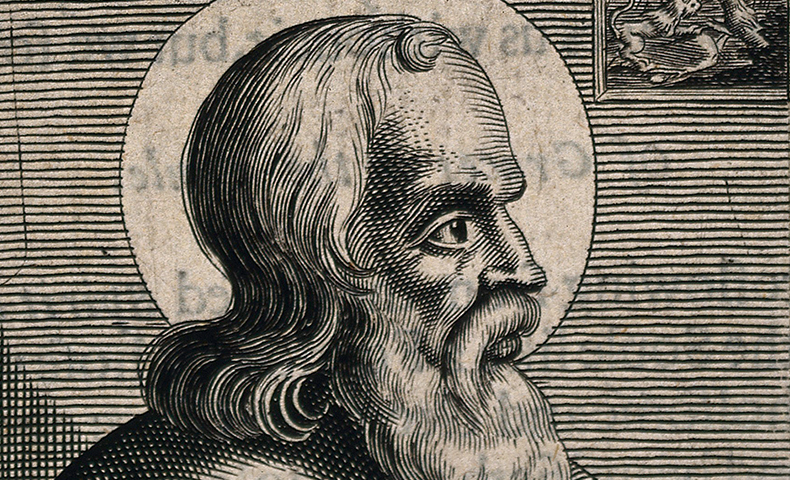 The "Acts" of Polycarp's martyrdom are the earliest preserved, fully reliable account of a Christian martyr's death. He died in 155. Polycarp was recognized as a Christian leader by all Asia Minor Christians-a strong fortress of faith and loyalty to Jesus Christ. His own strength emerged from his trust in God, even when events contradicted this trust. Living among pagans and under a government opposed to the new religion, he led and fed his flock. Like the Good Shepherd, he laid down his life for his sheep and kept them from more persecution in Smyrna. He summarized his trust in God just before he died: "Father... I bless Thee, for having made me worthy of the day and the hour..." (Acts of Martyrdom, Chapter 14).